Eight films down, twenty three to go. This week, our 31 Days of Horror continues as we check out big franchises like Cloverfield, The Conjuring and a return to the Texas Chainsaw Massacre series. A very contemporary film to kick off part two, Happy Death Day is essentially Groundhog Day, but with more murder. Jessica Rothe’s ‘Tree’ Gelbman wakes up on her birthday and goes about her usual college routine – bitchy sorority meetings, affairs with college professors, ignoring calls from her father and going out to parties – until she’s suddenly, randomly murdered, and is forced to replay the same day over and over again. While nothing Oscar worthy, Happy Death Day is a fun little flick for people who want to get into horror, but may be put off by the various frights and gory details, instead focusing on (admittedly cliché) character progression in an enjoyable mish-mash of genres. Although the time-loop is never explained, the evolution of ‘Tree’ is entertaining enough that next year’s sequel will probably bring in the crowds. Taking things back to the era of Hammer horror, The Man Who Could Cheat Death feels like a far cry from films like Happy Death Day and The Conjuring. Classic acting styles, camerawork and narrative flow pervade the film, making it a nice palate cleanser moving forward. The film follows Anton Driffing’s Dr. Bonnet, a man, as the title suggests, who has found a way to cheat death. Unfortunately, this process can often be deadly for those around him, spelling danger for Christopher Lee’s Dr. Gerard and his girlfriend Janine. The film is so much more romantic than the horrors you see in modern cinema, and it’s interesting to see how social norms have changed so vastly as documented in these classic films. Also interesting is the special effects, which while they may be mocked by today’s standards, look pretty impressive for a film that came out over half a century ago. More James Wan, this time with a focus on the supposed real-life exploits of paranormal investigators Ed and Lorraine Warren. A fictionalised documentation of a case that they had initially deemed too horrifying to reveal, the story sees Ed and Lorraine called to a newly bought farmhouse in Rhode Island, in 1971, where dark forces seek revenge on the new occupants of the house for ‘taking their land’. Patrick Wilson and his on-screen wife Vera Farmiga give some great performances amongst some genuinely scary moments, making The Conjuring a strong start to a new ongoing horror franchise. With my only previous exposure to Flatliners having been the trailer for the 2017 remake, I expected this film to be a lot more horror-focused than it actually is. The film follows five medical students as they take turns stopping their hearts and bringing each other back so they can all experience what happens after death. However, the more they experiment, the more problems they seem to bring back with them. In this nineties classic, the problems are merely sins committed in the past, some of which materialise in the form of a dead relative, others, a childhood bully. Overall, the film is very light on scares, but is a well directed story based around a fascinating concept. Plus, watching adult Kiefer Sutherland get bullied by a child repeatedly is quite amusing. This film is almost beat-for-beat the same story as The Conjuring. A young family, the patriarch of whom is Ryan Reynolds, moves into a house where a murder has previously been committed, and find themselves haunted by prior occupants, as they try to trick Reynold’s character into killing his new family. 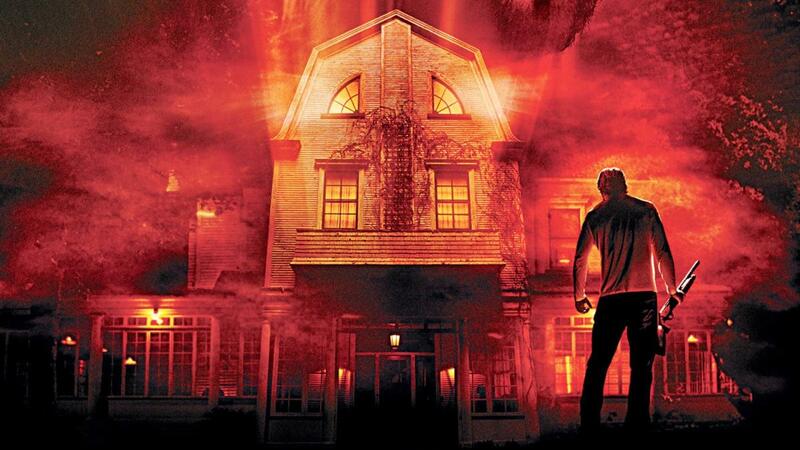 While The Amityville Horror does deviate from the path seen in The Conjuring somewhat (or rather, The Conjuring deviates from the path set in this earlier film), overall the similarities mean watching one will make the other extremely predictable. With some weirdly written characters and Ryan Reynolds essentially playing a more aggressive version of himself, this one is an okay watch but mostly forgettable. Returning to the Texas Chainsaw Massacre franchise, I was initially very excited to see this sequel jump into the action straight away, with a fantastically gory opening. From there, the film follows a DJ and a sheriff (the grandfather of the first film’s victims, no less) who team up to bring down Leatherface and his cannibal family. While the film boasts some truly unpleasant (in a good way) sequences, is generally more amusing and (I would argue) more entertaining than the first film, overall the end product still isn’t all that great. Chainsaw on chainsaw fights and a weirdly sexual encounter between Leatherface and Caroline Williams’ DJ ‘Stretch’ don’t distract from the fact that The Texas Chainsaw Massacre 2 still doesn’t showcase an actual chainsaw massacre. Unless I’m forgetting one of Leatherface’s victims, in my eyes, two or three disconnected murders does not a massacre make. I could come up with answers to these questions myself, but frankly, those answers would in essence be ‘because the plot demanded it’. The film also asks you to accept that Lena Headey’s Mary would make the morally righteous decision to save a stranger’s life, when it could cause the deaths of her own children. That is something that I cannot buy. Next up is Cloverfield, the found-footage hit from 2008, which follows a group of party-goers in Manhattan when a mysterious, gigantic monster begins attacking the city. Producer J.J. Abrams stated “I wanted something that was just insane and intense”, when talking about the creature’s conception, and that definitely translates not only to Cloverfield’s monster, but the film as a whole. Gloriously chaotic, the film demonstrates the panic and horror caused by this strange monster very effectively. While it’s a bit bizarre that both the towering beast and the National Guard manage to continuously sneak up on our heroes, the film does a good job of delivering empathetic characters with more context to them than you’d get in your regular found-footage feature. Beth definitely wasn’t worth all that effort, though. The newest and most anticipated film on the list, the new Halloween offers up a direct sequel to the 1978 classic in which Michael Myers, once again, breaks out of captivity, and begins a slew of new murders in his home town of Haddonfield. Meanwhile, PTSD-ridden former ‘Final Girl’ Laurie Strode is on the hunt for the man who forever changed her life that fateful Halloween night. Fortunately for Halloween fans everywhere, this film is pretty good. It’s not perfect by any means, but it pays homage to the original film in all the right ways, while updating it for the 21st century. Featuring more scares and a ton of gloriously brutal murders, in my opinion, this film is better than the original. Satisfying in all the right ways, Halloween ‘18 is a great showcase both for the character of Michael Myers, but also for the actress Jamie Lee Curtis, who gives a fantastic performance. I wish I hadn’t been eating when this film started. It’s really gross. From Beyond sees two scientists attempting to essentially open their ‘third eye’, and in the process, see creatures that come from beyond their conceivable reality. Over the course of the film, the two scientists are transformed in gruesome body horror fashion, with each transformation making them more and more disgusting to look at. Meanwhile, the lead female character gets transformed into a nymphomaniac, because that makes a ton of sense. Fans of the body horror subgenre will probably find some joy in this, but I personally won’t be watching it again, not because it’s a bad film, but just because it’s quite an uncomfortable watch. It’s just so gross. Despite my bold declaration that the first Friday the 13th was so bad that it put me off watching any sequels, listening to my barber rave about his love for characters like Michael Myers and Jason Voorhees convinced me to give the franchise another shot. Five years after the events of the first film, another bunch of youths return to Crystal Lake, not Camp Crystal Lake, but another camp that’s right round the corner. Because of course there’s another camp right around the corner. Anyway, Jason’s there, and after seeing his mother get decapitated in the original movie, he’s gonna wreak some havoc. Mildly entertaining, but mostly kind of stupid, Jason turns out to be less Michael Myers and more Leatherface, by which I mean, not all that threatening – you could no doubt out-think and confuse him if you were ever at his mercy. Why are these films so against a cunning antagonist? I had heard that Life was a bad film. But I’m a big science fiction fan, so I wanted to give it a shot anyway. The movie sees a group of astronauts and scientists retrieve a life sample from Mars, but this lifeform, which they name ‘Calvin’, starts growing into a carnivorous winged tentacle creature that bears some resemblance at first to a mutant starfish. The film is suitably exciting, but is held back by the fact that it doesn’t really take any risks. None of the ideas are all that original, and the characters, unfortunately, have no real character. One’s a dad, one’s paraplegic, one is Ryan Reynolds, and so on. They have only very basic development (and I use that word lightly) before they’re thrown into combat with the dreaded Calvin. And I know a lot of horror films are generally lacking in the character department, but when you snag Ryan Reynolds, Jake Gyllenhaal and Rebecca Ferguson to headline your movie, you could probably do a quick touch-up of the script. Lake Placid isn’t a good film. It has awkward romantic moments, poor CGI, weird jokes (especially by today’s standards) and a strange plot. After witnessing a diver getting mauled by an unseen animal on a nearby lake, a sheriff receives back-up to find this animal (later revealed to be a 30-foot long Crocodile) in the form of a rude New York paleontologist, a fish and game officer, and an eccentric professor and crocodile enthusiast. It doesn’t make a whole lot of sense, and neither do their various plans to catch this croc. But therein lies this films brilliance. The awkward interactions between characters, a madcap turn from Betty White, and a giant CGI crocodile fighting a bear. This film isn’t good. It’s amazing. But probably not in the way it intends to be. I tuned in for some Keanu, and what I got was a weird, perverted story that was akin to watching a middle-aged dad trying to awkwardly find common ground in conversation with teenagers (which does actually happen in this movie, but the whole first half of the film has that vibe). From Eli Roth, the man who bought us Hostel and The House with a Clock in Its Walls, Knock Knock sees devoted family man Keanu Reeves offer two young girls shelter after they’re caught in a storm, and when it comes down to it, really does not try hard enough to reject their advances. Having potentially ruined his marriage, Reeves’ character finds that he can’t get rid of his unwanted guests, who proceed to torture him in unconventional ways. To the film’s credit, I rarely could anticipate where it was headed. But between Keanu’s weird line delivery and that aforementioned perverted feel, I’m not sure the surprises were worth it. The final film of this segment, Wind Chill sees two college students, played by Emily Blunt and Ashton Holmes, car share back to Delaware, only to be caught in a crash and stranded in a snowy wilderness. Their secrets start to cause friction between the pair, which is in turn amplified by the presence of the various ghosts who previously faced similar situations. While a fairly average movie, I did find myself rooting for their survival, but think the film would have worked better without a supernatural element; just two students facing off against the elements. Although I suppose then it may not actually be a horror film. To be honest with you, watching this film just made me want to rewatch The Grey. But there’s still eight more horror films to go, so Liam Neeson fighting wolves will have to wait.